Currently I've been seeing people on my levels floating on obscene amounts of power 1.6 mil+ , I have no clue on how to reach that. All my heroes are using tier 4 runes respectively on their roles (front line - HP / def, back line - atk / crit). While having +30 on 3 star gears, and 50+ on level 4 and 5 gears i have and having most of my tech 70+ due to the honor boost from valentines event. To put things on to context, I am level 76 with 1.3 mil power. How do you raise your power to these amounts? from the reading : its not your runes, meh on your gears probably need to have no 3* gears, and not your honor then isnt it pretty obvious? it's your heroes. who are your heroes, what level are your heroes, and what Tier are they? MrHasuu wrote: from the reading : its not your runes, meh on your gears probably need to have no 3* gears, and not your honor then isnt it pretty obvious? it's your heroes. On the accounts of evolving aggrila and master wu, I have been saving the materials to get adept jansen. Can someone explain to me why having a high power matters? zxcvbnm6 wrote: Can someone explain to me why having a high power matters? Power is really the only thing that matters. It's pretty much like some DBZ stuff, "what's the scouter say about his power level!?" It's your damage and survivability, it determines where you stand in the arena and how far you'd be able to make it through dungeons. Low power, low damage. Low damage, not getting very far in the game. The whole purpose it to strive for more power. You should always want to be the best you can and that's why working on a high power matters. To answer OPs question, it's your heros. For being level 73 though you're doing fine. I didn't even get my first 5* until I was 75 so you can imagine how that went. You're reaching the point in the game where your power is gonna spike a lot. Just keep hoping for those 5*'s, keep leveling them up, and keep tiering them up and you'll be fine. P.S. Don't spend too much time working on 4*s, you'll replace them soon enough. I posted the topic when i was at the tail end of lvl 76 im now lvl 78! Thanks for the advice, just a little question. How do you chase for those tier 5 gear apart from booster chest. I could only buy 1 -2 per day depending on how nice these elite dungeons are! Besides booster chests, Crafting sun chests and using them also has a chance at getting you 5 star gear plans or even getting a whole 5 star gear if your really lucky. Shouldn't you be focusing on leveling up heroes/improving gear/getting better heroes/all that stuff? Power is just a good measure of how good you are, but its not an exact measure. Yup it's your heroes. First of all when your Jansen reaches Adept Jansen he'll drop to level 30 and tier 1 so you'll probably lose about 100k ~ 150k Power just from that. So i'd suggest wait til u have enough materials to pump him straight up to a useful tier. Agrila is pretty awesome for a 4Star hero theres no doubt, but in the end 4Stars Heroes will be replaced. So be prepared to replace her with a 5* hero. For now she can be a placeholder tank. Raciel .. i wasn't a big fan of raciel, i used one for a short while on Woofgang because i summoned a Super version. figured it was nice to have first turn AOE at low levels. but i replaced it the second i got a Nexara. Master Wu is a wonderful tank you can never go wrong with a master wu. level him/tier him , he's one of the so called "long term" heroes you can stick with until you get a 6* tank. Ygress .. i used Ygress for the longest time cause i made the assumption she was amazing cause of her backline attacking power. but later on i found out that her atk is really low for a 5* hunter and she became really weak in the high level 90s. If you take a look at the table and sort it by Class you can see that Ygress as the lowest ATK out of all hunters: http://pocket-knights.wikia.com/wiki/5_Star_Heroes If i were you i'd try and replace her but for now she's one of the only 5Star heroes you have so stick with her. Levels for your heroes are pretty important too, so make sure to level them. Fortifying is cheap when the levels are low so try to use as many materials as possible when your levels are low. when you're higher level most people rely on doing dungeons for EXP more than fortification since that becomes too costly. as for 4 and 5* Gears : open Moon and Sun chests, and collect Event Sun Treasure Chests from Boss event rewards + Courage checks. Here are my current teams for reference. As you can see my 2nd account is catching up to my first account since i knew what to do second time around. MrHasuu wrote: Here are my current teams for reference. As you can see my 2nd account is catching up to my first account since i knew what to do second time around. danm! Anyways seeing as my problem now for gaining power are these evolution materials. How do you efficiently gather them? I get alot of my stones and crystals from Dungeons and Star Chests. I buy Star chests in bulks and open like 1000 ~ 5000 chests at once. Once i opened them all i combine them until i'm out of 1* then do 2* and repeat til i'm done. 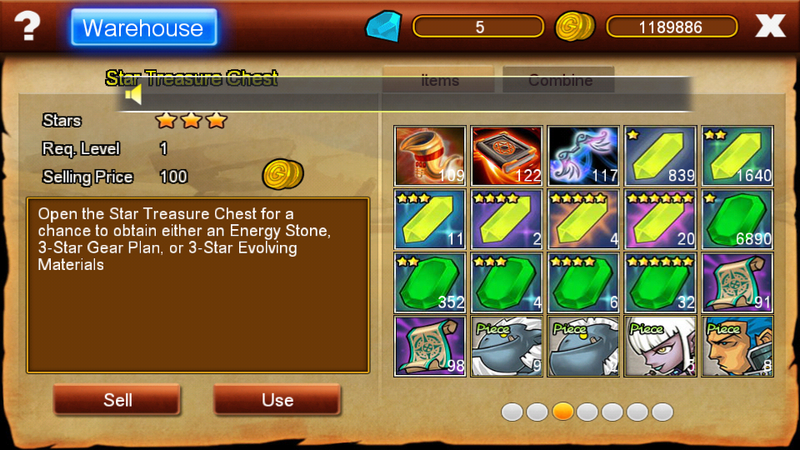 MrHasuu wrote: I get alot of my stones and crystals from Dungeons and Star Chests. I buy Star chests in bulks and open like 1000 ~ 5000 chests at once. Nice! One more question! How do you have so much money to sustain this! gold mine gets me around 400k ~ 500k per 4~6 hours?? I do towers for gold ..
theres also gold from the rankings/salary/VIP .. So i kinda picked up buying starchest from you, I had no idea. How good these things are! Although I am far away from stacking 100+ 6* evo mats, i think its well worth the investment. yup they're also a great source for spades -> maps -> booster gems -> spin vouchers, and the vip packs gives VIP EXP vouchers.